With the National Institute of Health’s Institute on Aging located on the Bayview Medical Center campus and a pioneering geriatric and gerontology program consistently ranked among the top four programs nationally, Johns Hopkins geriatricians have been for more than 30 years finding the answers to many of America’s health care problems. Here’s one: our population is living longer. That’s the good news. The bad news is that the cost of caring for an aging population is spiraling upwards as we become more frail, more prone to falls and more likely to experience flare ups of chronic conditions that typically require hospitalization. Johns Hopkins has developed evidence-based assessment tools and programs to improve both the quality of care and the quality of life for those 65 years old and older. To impact the tens of billions of dollars in annual health care costs related to falls—the leading cause of both death and injury in adults 65 years old and older—we developed the Johns Hopkins Fall Risk Assessment Tool (JHFRAT). The tool has been used throughout the Johns Hopkins Health System since 2003 and has decreased the fall rate by 21% and the fall injury rate by 51%. And JHFRAT can be embedded directly into your EMR. Frailty is among the leading causes of falls among older people, and Johns Hopkins faculty members have been using for more than 15 years an online assessment tool developed to provide a standardized method to consistently and accurately identify those patients who are most frail. Users enter five standardized measurements, which then automatically generates a single frailty score on a 1-to-5 scale. Used at Hopkins in both surgical and transplant services, the Johns Hopkins Frailty Assessment Calculator has contributed to clinical decisions that have reduced both post-surgical complications and pain and suffering while improving a patient’s quality of life. And now the calculator is available to both researchers and clinicians outside of Hopkins. Among the goals of the fall and frailty assessment tools is to keep older folks out of the hospital. Hospital at Home® is an innovative geriatric care model that provides hospital-level care in a patient’s home. Developed at Johns Hopkins, the program is currently adapted by numerous hospitals, health systems and managed care providers across the United States including VA hospitals. And when compared to similar hospitalized patients, Hospital at Home has demonstrated that it lowers mortality rates, lowers rates of delirium sedative medication and restraints use, and leads to a cost savings of 19% to 30%. Studies also have shown that it reduces caregiver stress, increases patient and family satisfaction and reduces the number of lab and diagnostic tests, all of which l;eads to better functional outcomes. 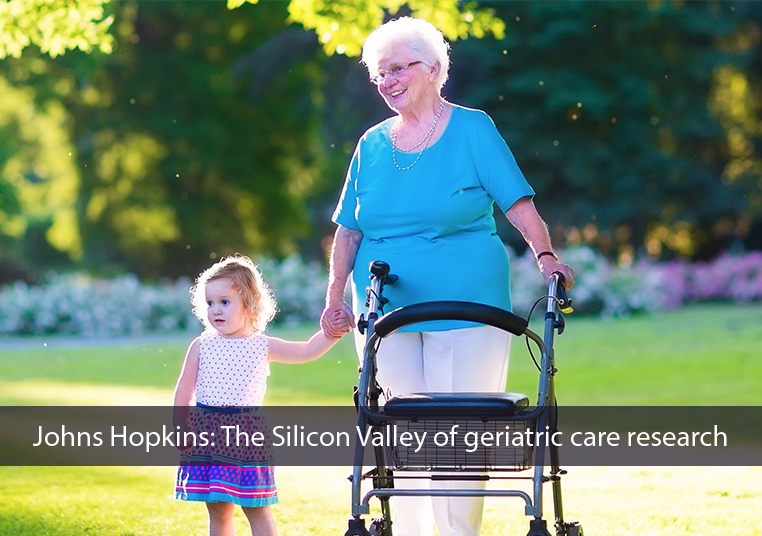 Read more about the Johns Hopkins solutions for managing your aging population, and watch a brief video program on the history of the Johns Hopkins Geriatric and Gerontology program.